. Published on Tuesday, November 22, 2016 . It isn’t always easy to find a hobby that evokes a passion and happiness in you the way that cycling does for Cal Poly Pomona (CPP) alumni, George Carr. What’s even harder is finding that hobby at the age of four. Having moved on from biking around the neighborhood as a child to preparing to compete in a four-day race in Costa Rica as a 2015 CPP graduate, you can say that Carr has an undying devotion to this passion. Though cycling is his choice of sport, Carr and his family are nature lovers, and he has always been interested in riding, climbing and more. 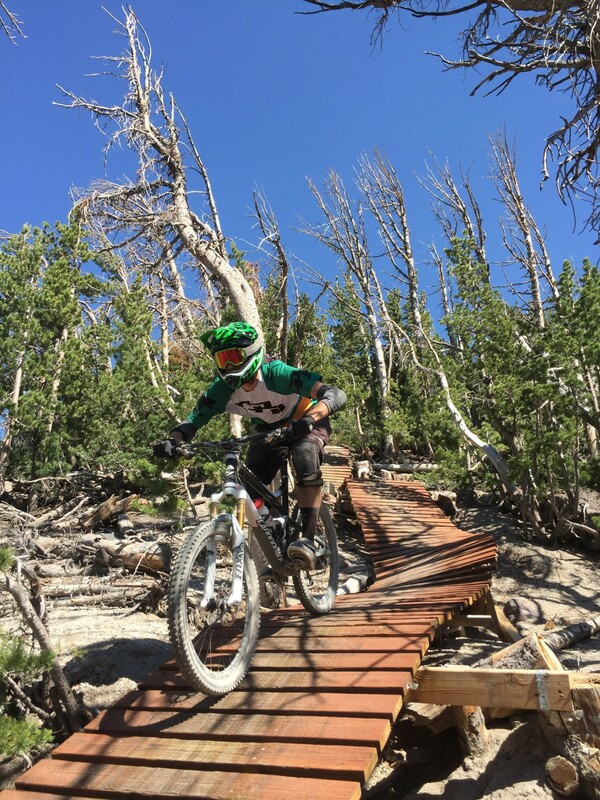 The sport comes with a reasonable amount of fear, but Carr has learned to set that aside to fully enjoy and immerse himself in his own personal version of bliss. How did you start cycling? Carr: As far as cycling goes, I’ve been riding as long as I can remember. I still remember my first time on a bike, when I was four and just how great I felt. It was a mode of transportation when I was younger, but friends started driving and you just kind of forget about riding. But then I got really stressed out about school, work or whatever else there is. I just needed to release some stress, and one night, for whatever reason, I thought, “I’m going to go on a bike ride.” I hopped on the bike, started riding and asked myself, “Why did I ever stop doing this?” From then on, I haven’t stopped, so for the past six years, I’ve been riding a few times a week. My family’s always been outdoorsy, but I guess I just re-lit the flame of my love for cycling. What are some of your favorite trails? Carr: I mostly only ride local, though I’ve been out of state a few times. My favorite trails are definitely mostly in Pasadena. There’s Chantry Flats; that’s a really fun place to ride. Echo Mountain. I did a really fun ride down the Santa Anas; now that was good. The trees and everything are just so beautiful. Is that what defines a good trail to you? The view? The difficulty? Carr: It’s hard to quantify that. It’s a feeling. A good ride can be 20 minutes long with good friends, just hanging out. It’s hard not to smile when you’re on a bike. If you ask me, there are no bad rides. I’ve never ridden a bad trail. Can you tell me more about your race in Costa Rica? Carr: I’m really excited about that. I caught wind of it three weeks ago when one of my friends asked me about it and I immediately said yes. I actually have very little information. I know it’s in Costa Rica, it’s four days long and… that’s about it! There are a lot of different styles of racing, and this one is a staged race. There are four days and five or six stages per day. I’m not a huge racer and a lot of the people who are doing it aren’t doing it for the competition. I think it’s really fun to be able to see where you stack up against others, but races like these are more about the experience. We’re spending four days in Costa Rica, not worrying about anything other than riding bikes, and that’s one of the most exciting things to me. No responsibilities, just make it down the hill. What’s your fondest memory with cycling? Carr: There are three types of fun: type-one fun, which is actual fun, like playing soccer, having a good time and smiling immediately; type-two fun, which is actually miserable at the time, but you look back and think, “Wow, that was really fun! We should do that again” and when you do it again, you probably still think it’s awful; and type-three fun, which is not fun while you’re doing it, and it’s still not fun after you’ve done it. So my favorite memory is a type-two moment, where we did a really long ride down in Santa Ana. We were on our bikes for about 10 hours. We started before sun-up and we got back to our cars just after the sun went down. I just remember pushing my bike as I walked and as soon as I got back on to ride, I’d get this rush of energy again. It put another smile on my face after grimacing for maybe six of the 10 hours. So much sighing and grunting and pushing, then you hop back on and you’re smiling. I remember the last descent, we got to this open area that had a bell. My friends and I were hanging out and breathing before finishing up. We rang the bell and looked out over the canyon at the sunset. It was open in front, trees behind, hillside all around and it was just a really nice moment, and I’ll never forget it. How did cycling contribute to your life? Carr: At the risk of being cliché, cycling defined a lot of it. I can honestly say I wouldn’t be where I am today without cycling. To expand on that, the CPP Cycling Club opened a lot of doors for me. There are some really cool people in there, and they got me my first job at a bike shop. At that bike shop, I met so many new friends who helped me become a better cyclist. After the shop, I joined another club with one of my cycling friends: Formula SAE, which is basically the only reason I have a job right now. None of this would’ve happened if I didn’t have a passion for cycling and hadn’t joined the cycling club. Any advice you have for students on the fence about cycling? Carr: As far as cycling goes, just do it; it’s so fun. Whether it’s mountain biking, road biking, cyclocross, adventure, backpacking—whatever you want to do, you’ll never have more fun than when you’re on a bike, enjoying time with your friends. Just do it. Make sure your bike works, join the cycling club and talk to everyone you can. Utilize your resources and get involved. You’ll find people you can relate to and talk to and have fun with. The longer we spoke about his love for riding, the wider the smile on Carr’s face grew, and it was apparent that nothing else can make him as happy as this sport does. As he packed up his belongings to take a quick climb at the Bronco Recreation and Intramural Complex’s (BRIC) Bronco Peak, the excitement painted on his face was enough to show that something as seemingly trivial as cycling can truly change a person’s entire outlook on life. Stay in the loop with anything and everything Campus Rec by following them on Facebook, Twitter and Instagram.